It�s time to venture forth and find some fresh sea air! In Trollhalla, you join forces with your fellow trolls to sail the seas in search of islands filled with pillage and plunder. Crunchy livestock, nervous monks, panicked princesses, piles of gold, and casks of grog await you! But watch out for Billy Goats--if you�re not careful they will knock parts of your precious stolen cargo out of your boat! Players take turns placing trolls on the board. 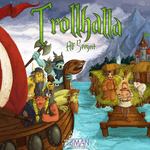 Trolls emerge from below each ship�s deck ready to plunder and scout the seas of Trollhalla! Trolls placed on ships claim plunder from nearby islands when a ship sails. Trolls placed in the sea will scout for destinations and determine where these ships sail, and also award players cards that perform special actions. The player who uses his trolls to fill his private boat with the most valuable collection of plunder wins the game!